I found a recipe for chocolate beet cake a while back on the Summit Springs Farm recipe page, and have been meaning to try it out.Â On my last trip to Axis Natural Foods, I saw Summit Springs Farm beets in the produce section, and decided to buy some to finally make this cake.Â The results were a very moist, not-too-sweet cake that would be excellent served warm with vanilla ice cream. Preheat oven to 375 degrees.Â Oil cake pan and dust with flour, or spray with non-stick cooking spray. Break chocolate into small pieces, place in a microwave safe bowl, and add about 3 tbsp. of the 1/2 c. of oil to the bowl.Â Microwave for 15 seconds at a time, stirring in between, until the chocolate is melted and well blended with the oil.Â Set aside. Combine eggs and sugar and beat until fluffy.Â Slowly beat in the remaining oil, chocolate mixture, beets and vanilla. In a large bowl, combine flour, baking soda, salt, and spices. Gently stir the flour mixture into the egg and chocolate mixture, pour batter into the greased pan, and bake for about 30 minutes or until a toothpick test proves the center is properly cooked. 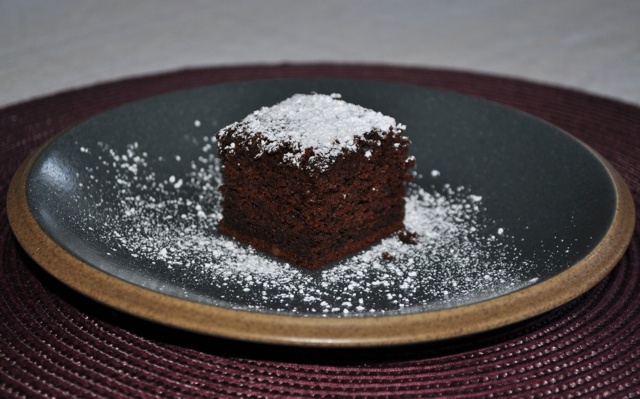 This entry was posted in Desserts & Sweets, From the Garden, Made in Maine and tagged Chocolate Beet Cake, Summit Springs Farm. Bookmark the permalink. Interesting, kinda like sauerkaut cake makes for a nice moist cake.